Jessamyn Duke might be one of the members of Ronda Rousey’s exclusive “Four Horsewomen” crew, but she might soon not be a member of the UFC. Duke lost her second straight scrap inside the octagon, one fight after UFC president Dana White was critical of her reluctance to pull the trigger in a defeat to Bethe Correia. However, on Wednesday, there was a reason why Duke wasn’t able to lay the lumber – at least with her left hand. Duke broke her left haymaker in the opening ticks against Leslie Smith, which ultimately cost her a TKO loss. “Prefight interview I said @lesliesmithmma had a brick head & could take a lot of punishment. Karma. 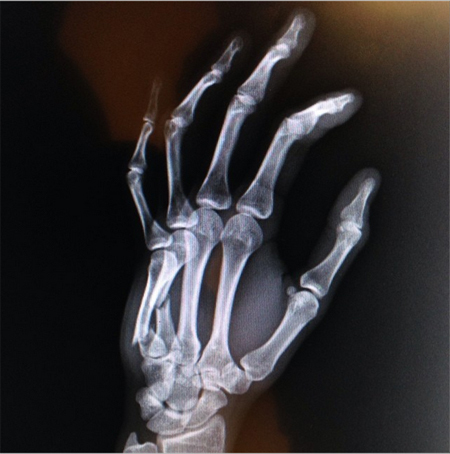 #ufcfightnight45 #gunclub” Duke posted on Twitter with the above X-ray. Duke now owns a 3-2 (1 NC) professional record. She might be granted a reprieve by UFC brass given the injury she suffered against Smith and the fact that she’s buddies with Rousey.